1. What is the HDFC Bank Debit Card and Credit Cards Offer ("Offer")? (a) Shop on Amazon.in using your HDFC Bank Debit Card or Credit Card to avail 10% Instant Discount with HDFC Bank Debit Card or Credit Card up to a maximum of Rs.1,500. (b) The Offer is applicable only for a transaction on Amazon.in (Site and/or App) using your HDFC Bank Debit Card or Credit Card during the Offer Period, for a minimum of Rs.2,000. (c) The Offer is available from January 21, 2018 to January 24, 2018 ("Offer Period"). For Amazon Prime members, the offer is valid from 12:00 noon January 20, 2018 to January 24, 2018. (d) Please ensure you checkout with single item of the product to avail Instant Discount. No other product should be added to the cart. If more than 1 product or item is added to the cart, you will be eligible for cashback, and not Instant Discount. (f) The maximum cumulative cash back and Instant Discount for Amazon.in customers is Rs.1,500 across all transactions conducted on Amazon.in during the Offer Period. (g) The Offer is applicable for a successful transaction, upon adjustment for refunds, conducted on Amazon.in (Site and/or App) using your HDFC Bank Debit Card or Credit Card during Offer Period. (h) Any cancelled order(s) will not be eligible for the offer and the refund amount of such orders will be adjusted with the instant discount amount for the purpose of the Offer. Shop as usual with your HDFC Bank Debit Card or Credit Card to pay. As long as Rs.2,000 or more is charged to your HDFC Bank Debit Card or Credit Card while making a purchase of an eligible item on amazon.in/Amazon App, you will get an Instant Discount on the purchase. Only single quantity of the eligible item should be added to your cart. 3. What is the minimum transaction size for the discount for the duration of the event? The minimum transaction amount to avail cash back is Rs. 2,000 in a single transaction on Amazon.in, net of buybacks, refunds and cancellations. 4. Would I get an Instant Discount if I make a part payment using my Amazon Pay Balance? Yes, you would get Instant Discount but only on the amount charged on your HDFC Debit or Credit Card. Also, to avail instant discount, your HDFC Debit or Credit Card should be charged for a minimum amount of Rs. 2,000. For example, if total transaction amount is Rs. 8000, and Rs 1000 is paid using Amazon Pay Balance and Rs. 7000 is paid using HDFC Debit or Credit Card, then instant discount would be given on Rs 7000 and not Rs. 8000. Similarly, if Rs 7000 is paid using APay balance and Rs 1000 paid using HDFC Debit or Credit Card, then customer would not get any cashback because the amount paid using HDFC Debit or Credit Card is less than Rs. 2,000. 5. What is the maximum Bank offer that I can avail? The maximum cash back or discount per card is Rs. 1,500 across Site and App during the Offer Period. Add-on cards linked to the same account will be considered as one card. 6. Can I get both Instant Discount and Cashback on the same purchase? No, on any order, the customer will either be eligible for cashback or instant discount. Both the offers cannot be availed on the same order. 7. Is Discount under this Offer applicable on credit and debit cards? Yes, the discount is available on both, HDFC Bank Debit Card or Credit Card. 8. Can I avail discount on credit card on EMI? Yes, the discount under this Offer is also applicable on EMI availed on HDFC Bank Credit Cards. 9. Can I get this offer with Exchange offer or No Cost EMI? 10. Can I avail discount on card payment for cash on delivery orders? Are net Banking transactions also included in this Offer? Net Banking transactions are NOT included in this Offer. Card on Delivery is eligible for cashback and NOT Instant Discount. 11. My payment failed while placing the order; will I be eligible for the cash back under this Offer? 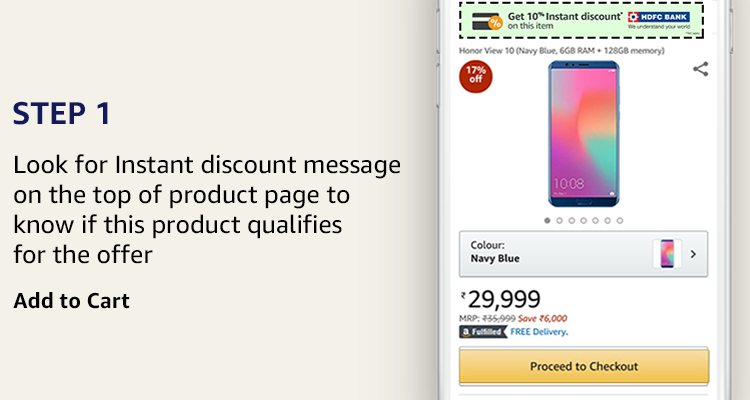 This Great Indian Sale Offer ("Offer") is provided to you by HDFC Bank Limited ("Bank") and Amazon Pay (India) Private Limited (formerly known as Amazon Online Distribution Services Private Limited) ("Amazon") and made available on the website www.amazon.in and the mobile site and mobile application thereof (collectively, "Amazon.in"). All residents of India holding a valid credit card or debit card issued by the Bank (each a "Card") are eligible to avail the Offer (each a "Cardholder"). The Offer is valid from January 21, 2018 to January 24, 2018 (both days inclusive) ("Offer Period"), unless revoked or extended by Amazon in its sole discretion, without any prior notice and without liability. For Amazon Prime members, the offer is valid from 12:00 noon January 20, 2018 to January 24, 2018. On select products, customer can avail an instant discount, provided he checks out with a single quantity of that product alone. Each Cardholder can avail a maximum cashback or instant discount of INR 1,500 per Card under this Offer for the purchases on Amazon.in using the Card, irrespective of number of purchases. The customer can avail either a cashback or an Instant Discount on the same purchase. If the customer avails Instant Discount on a purchase, the customer would not be eligible for cashback for the same purchase. Although any cashback which is not utilized with Instant Discount can be availed on any other purchase during the offer period as long as it follows the offers terms and conditions. The purchase of the product(s) will be governed by the terms of sale, including terms of exchange (wherever available), applicable to the sale of the product(s) on Amazon.in. This Offer will also be applicable on purchase of product(s) by the Cardholders under an exchange offer. 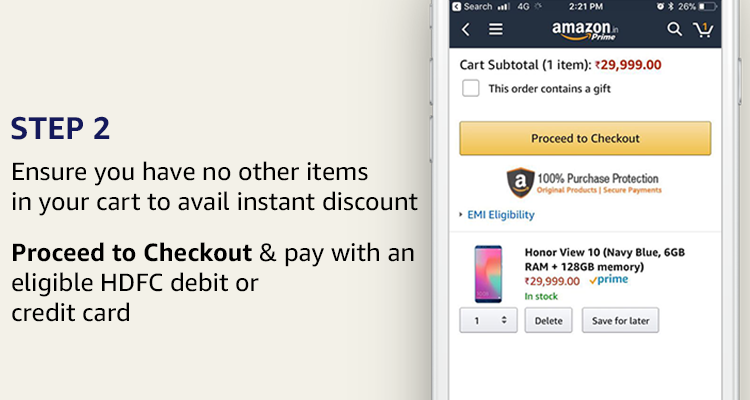 This Cashback Offer is also applicable on payment made by Cardholders using the 'Cash on Delivery' payment option provided that: (a) the order(s) is placed by the Cardholders on Amazon.in during the Offer Duration; and (b) the Cardholder, at the time of delivery of the order, makes the payment via a card accepting machine carried by the delivery associate, using the Card. In the event, for any reason, the card accepting machine is not available or is not working, the Cardholders will not be entitled to avail the Offer. The Instant Discount offer is not applicable if payment made by card at the time of delivery. 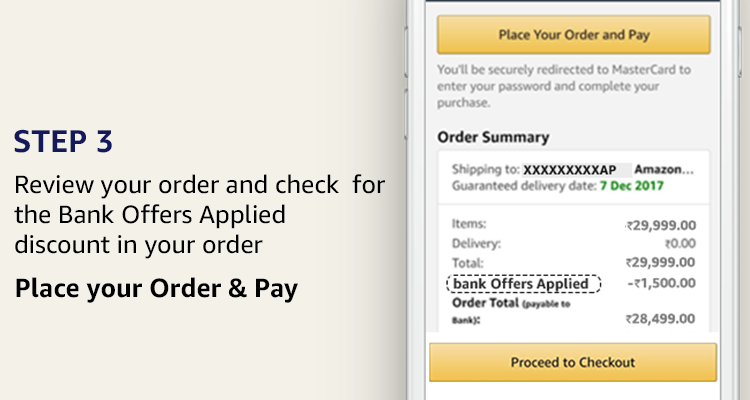 In the event the order is returned or cancelled by the Cardholder, seller or Amazon Seller Services Private Limited, for any reason whatsoever, and subsequently the order / purchase transaction value falls below INR 2000/-, the order will not qualify for this Offer and the participation of the Cardholder will be deemed withdrawn. If Instant Discount is availed on any purchase, and the transaction is subsequently cancelled, the refund amount of such orders will be post adjusting the instant discount amount availed on the purchase. Nothing contained herein amounts to a commitment by Amazon or the Bank to conduct further, similar or other offers. The above Offer is by way of a special offer and nothing contained herein shall prejudice or affect the terms and conditions of the card member agreement (if any executed by the Bank). The terms of the above schemes shall be in addition to and not in derogation of the terms contained in the card member agreement. This Offer is not valid on corporate or commercial cards issued by Bank. All disputes between the Cardholders and the Bank will be resolved inter se and Amazon will not (nor will be liable or obliged to) mediate or resolve any dispute or disagreement between the Cardholders and the Bank. This Offer cannot be availed on: (i) purchase of the ineligible / excluded products mentioned above; or (ii) purchase by Cardholder using any card other than the Card (mentioned above). The cashback will be credited in the eligible Cardholder's account by the Bank by 24th March 2018. Any queries/issues relating to cashback will be entertained by the Bank only till 24th April 2018. For the avoidance of doubt it is clarified that a Cardholder must address the queries/issues relating to the cashback to the Bank only. Where the customer avails the Instant Discount at the time of purchase, no cashback would be credited later. Under no circumstances, will the cashback being offered under this Offer be settled in cash in lieu thereof by Amazon. By participating in this Offer, every Cardholder expressly agrees that Amazon or any of its affiliates will not be liable or responsible for any loss or damage whatsoever that a Cardholder may suffer, directly or indirectly, in connection with this Offer, including but not limited to that associated with his/her use or delivery or misuse of any product purchased on Amazon.in. The Cardholders are not bound in any way to participate in this Offer. Any participation is voluntary and the Offer is being made purely on a best effort basis.